It's funny but very dirty and obscene not fit for kids to watch. Yet, parents bring their kids to see it. Hilarious-- I can see things like this happening in an extreme lifetime, but funny nonetheless...I took my 2 grandsons, ages 6 and 11-- a little too crass for them, but they sure did laugh a lot, as I did too. Terrible! 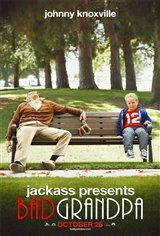 Don't understand how Johnny Knoxville gets the freedom to continue to make movies. Not bad, some funny bits. This movie makes me laugh so loud! Great story. Saw the trailer and it looks hilarious. cant wait to see it! Good for a laugh in some spots. I would recommend this movie if you are in a mood for silly, crude humor. Not a classic, but okay.